Tennessee is one of nine states in the United States that does not or nearly does not have income taxes. The state isn't entirely income tax-free, as Tennessee still has the Hall Tax, which is a flat tax on interest and dividends. It might sound like a great deal, however, there are other ways that the state gets you: sales tax, for example. Tennessee has the highest sales tax in the nation—and, you're being taxed not just for merchandise. Essentials like food are taxed, too. In 2016, the state legislature voted to repeal the Hall Tax, barring any additional legislative changes. The change will go into full effect on Jan. 1, 2022. The plan is to decrease the Hall Tax by a percentage point each year until 2022, assuming the state meets specific revenue targets. Up through 2016, the Hall Tax was a flat 6 percent. It mostly affected seniors and others living off of stocks and bonds, like retirement accounts and capital gains, rather than wages and salaries. The Hall Tax was added to the constitution in 1929 and is named for the representative that sponsored the policy. Tennessee had a gift tax that was repealed in 2012. The state’s estate tax was abolished in 2016. Alaska, Florida, Nevada, New Hampshire, South Dakota, Texas, Washington, and Wyoming have no income tax—for any residents. For retirees, in particular, that means no state income tax on Social Security benefits, withdrawals from IRAs and 401(k)s, and payouts from pensions. Altogether, states with no income tax tend to place a disproportionately high tax burden on the poor. Five of the no-income-tax states—Florida, South Dakota, Texas, Washington, and Tennessee—are ranked on the Institute on Taxation and Economic Policy’s “Terrible 10” list for unfair taxing. How Is Paying No Income Taxes Unfair? Paying no income tax means that there has to be a "take" from somewhere else to pay for all the things the state needs. In the case of Tennessee, that's in sales taxes. The lowest earners in the state devote most of their take-home pay to buying things that are subject to sales taxes. The wealthy can invest their higher salaries in 401(k) and other options. Their exposure to the sales tax may be the same as the lowest earners, but sales taxes are negligible when you are rich. So, it seems unfair to harshly tax those people who are scraping by to make ends meet. States that use an income tax structure help the poorer classes. Income tax is a classic tool for redistributing wealth. It’s usually “progressive” in nature, meaning that it taxes higher earners at a greater rate than lower earners. Sales taxes, for example, are considered “regressive.” They don’t change depending on the income level of the consumer. They treat everyone the same. These taxes apply to food, gasoline, and other essential, consumable items. The apparent positive aspect of having no income tax on personal wages and salaries is that most Tennessee residents can pay less in taxes each year. Tennessee residents only have to pay Federal Income Taxes each April, for the most part. This can make the state more attractive for business growth and for maintaining a well-educated labor pool. The Volunteer State, which reviles income taxes so much that voters changed the Tennessee Constitution to forbid these taxes for good, charges a seven percent sales tax statewide (as of June 2018). When combined with local sales taxes, the combined rate increases to an average of 9.45 percent, according to estimates from the Tax Foundation. That’s more than double the combined rate in super-touristy Hawaii. In Shelby County, which is the county containing Memphis, sales tax is 9.25 percent on general merchandise and 7.75 percent on food, total (as of June 2018), which is the highest rate in the United States. This can cause necessary expenditures to be less affordable overall, meaning that those who make less in personal income wages pay a disproportionate amount of taxes overall. Some media outlets claim that Tennessee has the most regressive tax policy because it benefits the wealthiest residents. 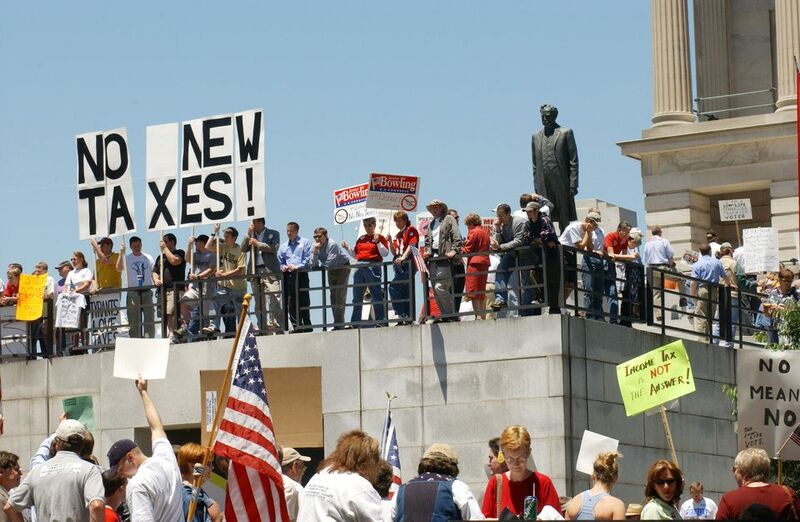 From time to time, state legislators attempt to enact an individual state income tax, but conservative groups often protest, and the measures fail. Learn more about Tennessee taxes through the Tennessee Department of Revenue. Every year, Tennessee has a tax-free weekend where certain items—in particular, school supplies and clothing—can be purchased without the sales tax. Those items include clothing and school supplies from $100 or less and computers $1,500 or less. The holiday is always from 12:01 a.m. on the final Friday in July to 11:59 p.m. on that following Sunday.